← NACCHO Aboriginal Health and #Uluru #Voice #Treaty @RecAustralia Reconciliation Australia’s Vision of National Reconciliation is based on five critical dimensions: race relations, equality and equity, institutional integrity, unity and historical acceptance. 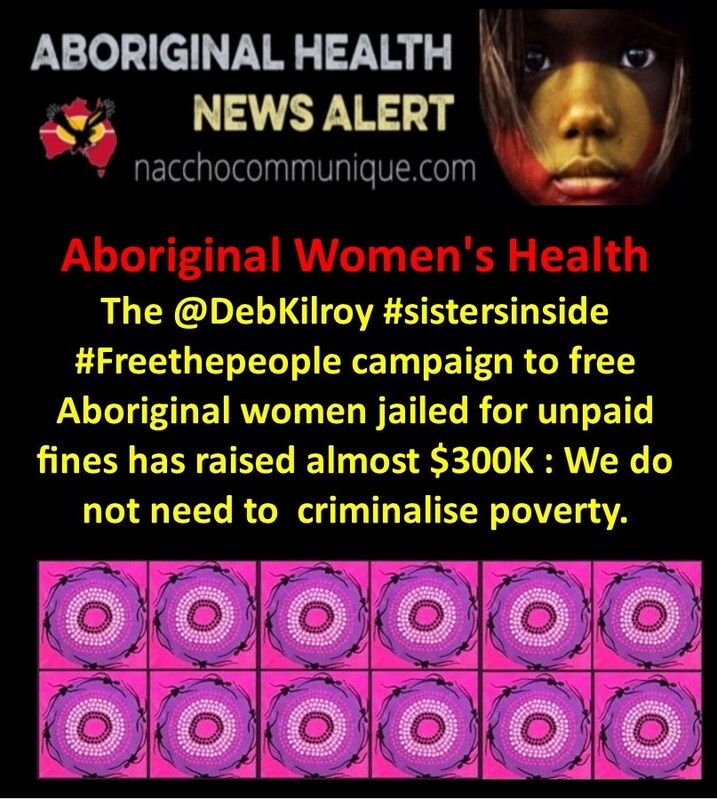 NACCHO Aboriginal Women’s Health : The @DebKilroy #sistersinside #Freethepeople campaign to free Aboriginal women jailed for unpaid fines has raised almost $300K : We do not need to criminalise poverty. “Originally the campaign asked people to give up two coffees in their week and donate $10 so we could raise $100,000. “The money will be there for any woman who’s imprisoned, and the money will be spent on the community for women who have warrants for their arrest by the police. 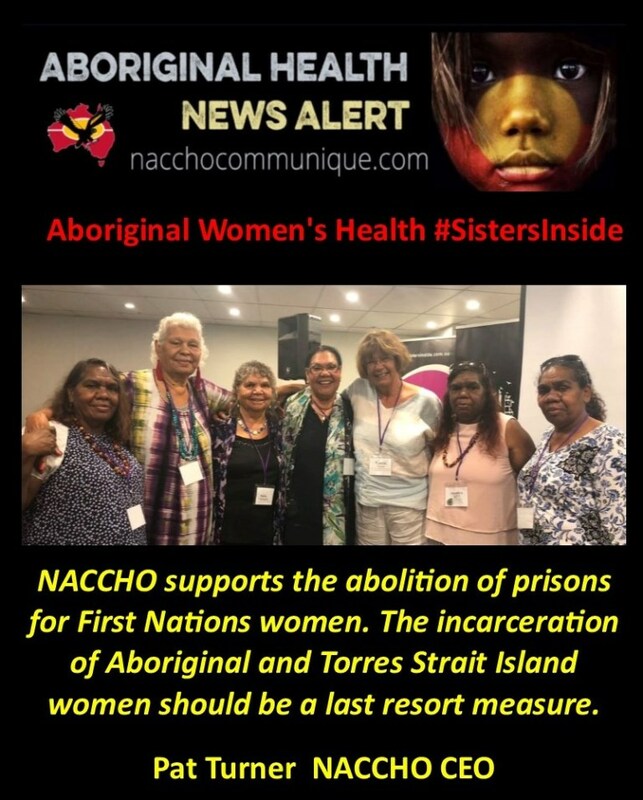 ” NACCHO supports the abolition of prisons for First Nations women. The incarceration of Aboriginal and Torres Strait Island women should be a last resort measure. It is time to consider a radical restructuring of the relationship between Aboriginal people and the state. Aboriginal and Torres Strait Islander people and their communities must be part of the design, decision-making and implementation of government funded policies, programs and services that aim to reduce – or abolish –the imprisonment of our women. Increased government investment is needed in community-led prevention and early intervention programs designed to reduce violence against women and provide therapeutic services for vulnerable women and girls. Programs and services that are holistic and culturally safe, delivered by Aboriginal and Torres Strait Islander organisations. NACCHO calls for a full partnership approach in the Closing the Gap Refresh, so that Aboriginal people are at the centre of decision-making, design and delivery of policies that impact on them. Part 1: The campaign was launched on 5 January with the aim of raising $100,000 – enough to clear the debt of 100 women in Western Australia who have been imprisoned or are at risk of being imprisoned for unpaid court fines. But as of this morning 16 January the campaign has already raised $280,460, after attracting international attention. WA is the only state that regularly imprisons people for being unable to pay fines, and ALP research in 2014 found that more than 1,100 people in WA had been imprisoned for unpaid fines each year since 2010. Under current state laws, the registrar of the Fines Enforcement Registry, who is an independent court officer, can issue warrants for unpaid court fines as a last resort. The campaign’s crowdfunding page said this system meant Aboriginal mothers were languishing in prison because they did not have the capacity to pay fines. “They are living in absolute poverty and cannot afford food and shelter for their children let alone pay a fine. They will never have the financial capacity to pay a fine,” the page said. Money raised from the campaign has already led to the release of one woman from jail, while another three women have had their fines paid so they won’t be arrested. Campaign organisers are currently working on paying the fines for another 30 women. The success of the campaign has put pressure on the WA government to reform the law to stop vulnerable people entering jail. Kilroy said the current law criminalised poverty and she criticised the Labor government’s inaction on the issue despite making a pledge to repeal the lawwhile in opposition. “The government said prior to their election victory that this was one of their policy platforms, but it’s now been two years and nothing has changed,” she said. A spokeswoman for WA Attorney-General John Quigley told Pro Bono News the government intended to introduce a comprehensive package of amendments to the law in the first half of 2019, so warrants could only be handed down by a court. “These reforms are designed to ensure that people who can afford to pay their fines do, and those that cannot have opportunities to pay them off over time or work them off in other ways,” the spokesperson said. The Department of Justice has denied the campaign’s claim that single Aboriginal mothers made up the majority of those in prison who could not pay fines. Departmental figures provided to Pro Bono News state that on 6 January, two females were held for unpaid fines, one of whom identified as Aboriginal. According to the department, data suggests there has not been an Aboriginal woman in jail in WA for unpaid fines since the campaign started on 5 January. The WA Department of Justice said numbers of people jailed solely for fine defaulting had fallen sharply in the past 12 months — with the average daily population falling to “single digits”. WA Attorney-General John Quigley agreed, saying said recent figures also showed a recent drop in the number of Indigenous women in custody for fine defaulting. Mr Quigley said the issue of fine defaulters going to prison would be addressed very soon. “I have a whole raft of changes to the laws through the Cabinet, and [they] are currently with the Parliamentary Council for drafting to Parliament,” he said. In terms of the money raised by Sisters Inside, Mr Quigley said he hoped it was being put to good use. Ms Kilroy told the ABC the money raised by donors would be spent on supporting formerly incarcerated women and ensuring any outstanding warrants were paid so the women were not at risk of jail. 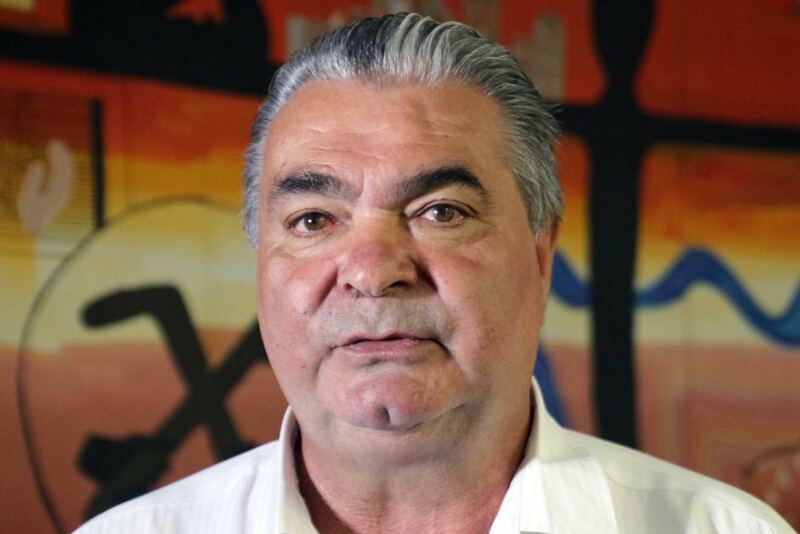 WA Aboriginal Legal Service chief executive Dennis Eggington said Indigenous women, and those in poverty, were disproportionately affected by the practice of jailing for fines. “Fines do not have any correlation to someone’s income. If you get $420 on Centrelink and then face a $1,000 fine you are in real trouble and you are not going to be able to pay the fine,” he said. PHOTO Dennis Eggington for some people it’s easier to go to jail than find the money for fines. He said there was a culture which had led to many Indigenous people feeling as though they had no choice but to go prison for fines. “It’s much easier to do a couple of days in jail and cut your fine out than to try and find the money to pay the fine,” Mr Eggington said. ”It’s an indictment on the country; It’s an indictment on Australia as a whole that we as one of the most disadvantaged group in Australia have had to develop those ways to survive.